A half stack is a guitar amplifier setup consisting of an amp "head" and a single 4x12 feet speaker cabinet. The amp head is typically placed on top of the cabinet. This configuration is so named because many professional guitarists began using two 4x12 cabinets with an amp head on top, or a "full stack," in the early 1960's. Half stacks became popular as live sound reinforcement systems improved, and the need for high stage volumes decreased. A half stack is simple to set up with a few cables. Place your amplifier on top of your speaker cabinet so it sits level and secure. Locate the impedance rating of your speaker cabinet. This rating should be clearly labeled near the input jack on the back of the cabinet. Connect a 1/4-inch speaker cable to the input jack of your speaker cabinet. If your cabinet offers stereo connections, start with the left input. Connect the other end of the cable to the speaker output jack of your amplifier. 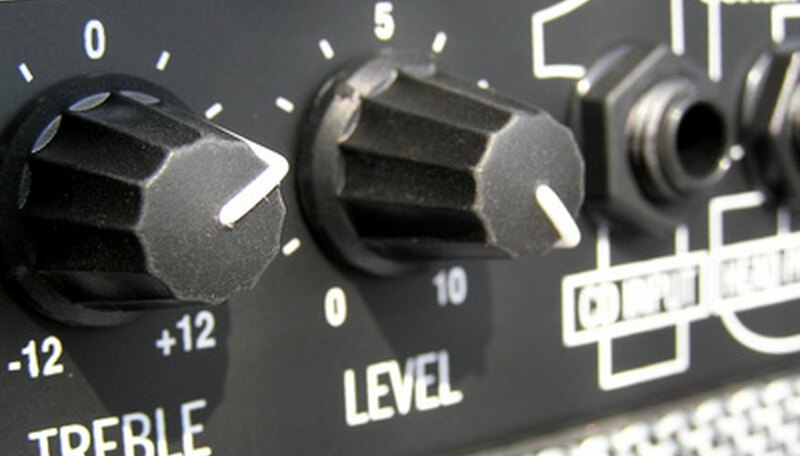 If your amplifier offers more than one connection for different impedance ratings, choose the one that is equal to or greater than the rating of your cabinet. Connect your power cable to a grounded outlet, and connect your guitar to the main input of your amplifier using a 1/4-inch instrument cable. If you are using a tube amplifier in your half stack, remember not to power on the amplifier--unless the speaker cabinet is connected to it. This can damage your amplifier. David Medairos is a freelance writer and musician. With more than 10 years of experience in various fields, he has amassed a general knowledge of most technical and mechanical subjects, computer science and audio engineering, as well as R&D, customer service and marketing. He has written for "Connections Magazine," and is a frequent blogger on several consumer tech sites.